“Make sure you let people know we are, first and foremost, a social club. We cook together… but we also laugh a lot.” Not sure which member of the Marmitons group spoke these words, I just remember he said it as he prepared to slice up a pile of leeks. 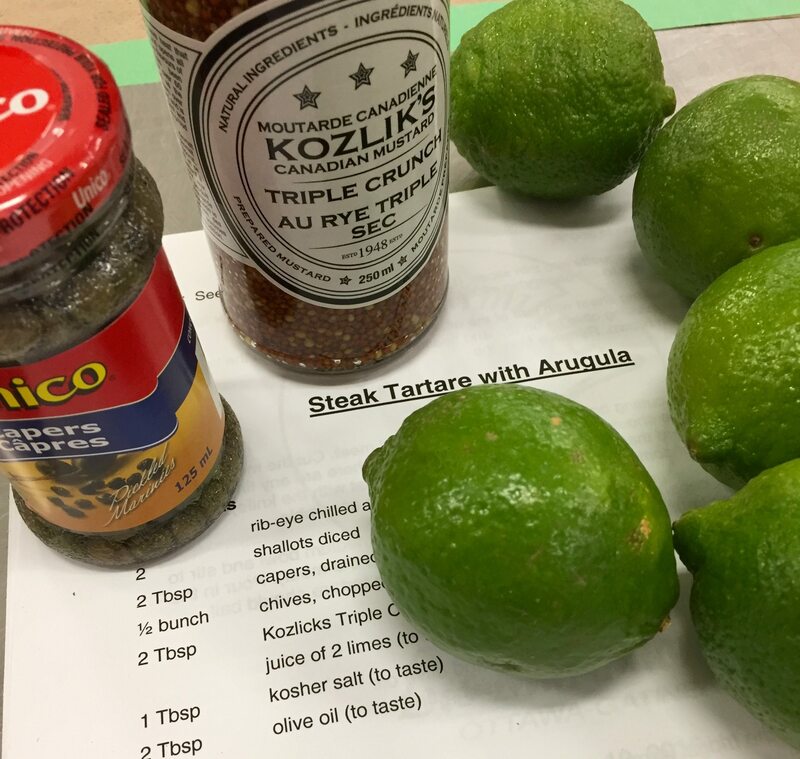 He was a member of the ‘Smoked Trout Tart Team’ – three fellas in charge of making Smoked Trout and Leek Tart with Arugula Pear Salad – a recipe by Patrick Garland of Absinthe Café that appears in my book, Ottawa Cooks. Les Marmitons is an international social club of gentlemen cooks. The Ottawa-Gatineau chapter was formed in 1983, and sees men regularly cooking, learning, and feasting in the kitchens of Saint Paul University. It may seem dated, or quaint (or even disturbing, depending on your take on men-only clubs), but having spent a day with these guys, my view is that any organization bent on getting men into the kitchen to master gourmet meals is not a thing to be fretful about. It beats my husband’s hockey club, which feeds me not at all. Besides, none of the wives or partners I met at Les Marmitons’ Christmas dinner seemed to mind one whit that they sit, eat, and drink, while the men cook, serve, and clean up. Some of these gents cook quite well (and often) and clearly have talent. Others, well, less so. But all are bent on improving their kitchen skills and building their recipe repertoire, and all seem to enjoy keenly the camaraderie of the gastronomic club. Marmiton means ‘kitchen boy’ and these boys generally prepare fancy meals under the direction and tutelage of a real live chef — like Pat Garland. Or Michael Moffatt of Beckta, who has been a Marmitons faithful. So has chef John Leung of Steak & Sushi and NeXT chef Michael Blackie. Les Marmitons have also worked with the late Kurt Waldele of the NAC, and with Robert Bourassa (chef/owner of the now departed Café Henry Burger), along with dozens more chef-guides in the long life of this chapter of Les Marmitons. I was that guiding hand on a recent Saturday night, or at least the writer standing in for one. The gents of Les Marmitons were cooking their annual Christmas dinner based on nine recipes plucked from the pages of Ottawa Cooks. And what an honour it was to have these merry men work their way through my book, and then to sit down with them, their wives, partners, and guests, to feast in the dining hall of Saint Paul University. This was Les Marmitons’ annual December dinner and chef Garland’s tart was the opening course. 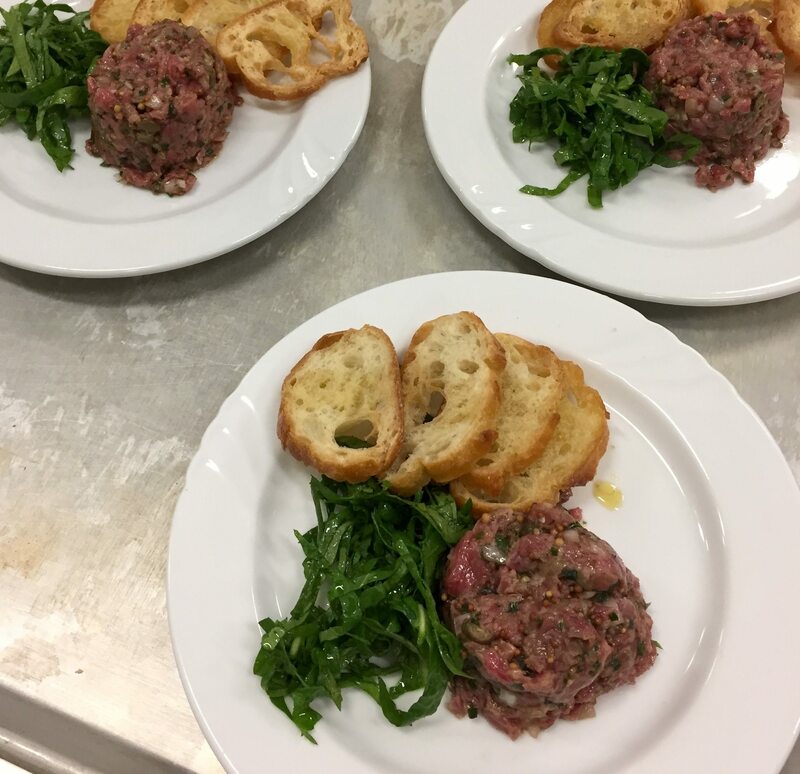 Other teams were working on course two (chef Michael Blackie’s recipe for Steak Tartare with Kozlik’s Triple Crunch) and course three, MeNa chef James Bratsberg’s Quail Confit with Beets. There were teams labouring on appetizers – chef Marc Lepine’s smoked avocado purée (one component of many in his recipe called Pomelo Anderson); Restaurant e18hteen’s stunning Chicken Liver Mousse; and the El Camino contribution by chef Matthew Carmichael of Wild Salmon Tartare. After trout tart, steak tartare, and quail, came Supply & Demand chef Steve Wall’s Kale Salad (in which great liberties were taken with the suggested amount of garlic), and then it was back to Pat Garland for a much welcomed sweet ending: Chocolate Moelleux with Crème Anglaise and Raspberry Coulis, masterfully executed. Marmitons member and sommelier, Joe Hatz, did a splendid job with the wine pairings. A club set up with the express purpose of bringing men together to cook strikes me as a mighty noble one. That they chose to cook my book was an honour.